Towards the end of last year, I bought a DNA testing kit from 23andme. I was interested in finding out more about where I come from, what genetic traits I have and if I could find any long-lost relatives. I kept a log of the process for my amusement and wanted to share the experience here. 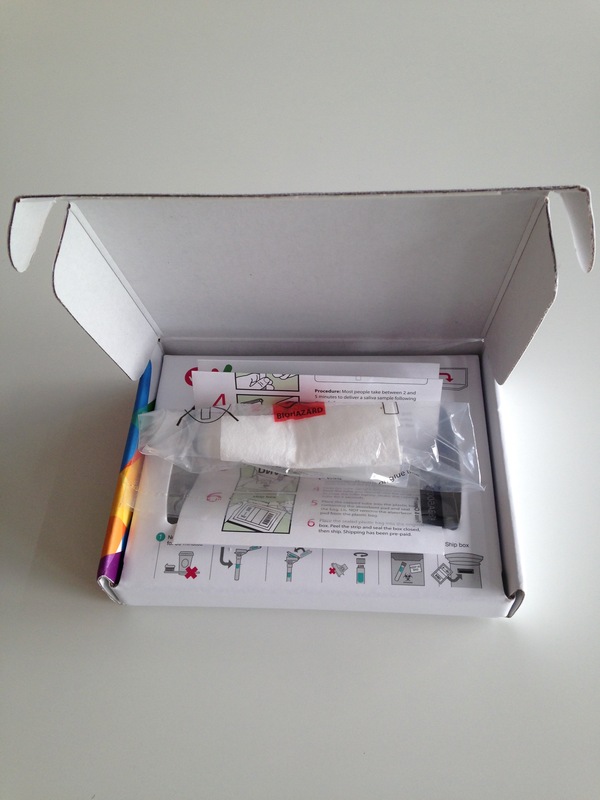 The DNA testing kit comes in a neat little box and is easy to use. All you do is open the holder, spit into it (you need a lot of spit so this takes a while) and seal it up again. 23andme include return postage in the price, so you just pop it in the mail and wait. The wait is long. Very long. Thankfully, 23andme do a great job of keeping you informed of where your kit is and what you can do on the website in the meantime. That said, I had lost interest by the time I got an email saying my results were ready. Seeing the results email land did perk my interest back up. No doubt like many, I was nervous to find out about any health risks I might face. First off, my ancestry though. As expected, I’m 99.7% European and of that 98.5% Northwestern European. The DNA test did not find any close family. The closest match is a 3rd to 4th cousin who shares 1.10% of DNA with me. I am 2.7% Neanderthal, which is exactly average for Europeans. Lastly, my health results. I had no increased genetic risk factor for any of the illnesses 23andme test for. This was a relief as I was worried about Alzheimer’s. I also show no signs of inherited conditions. The first result of interest shows that I have reduced odds of responding well to Hepatitis C treatment. I’m not in the worst group, but less than ideal. I’m also likely to have a “rapid” or “ultrarapid” metabolism, which means I may need different doses of certain drugs for them to be effective. The 23andme experience was slow but interesting. By the time my results came, I had lost most of my motivation for trying it out. However, it was fun to read through the health risks and traits, and good to learn nothing alarming. The downside of learning nothing alarming is that it feels like a bit of a waste of time and money! That’s no fault of 23andme of course and I hope that they can learn more from my sample over time. I also enjoy keeping an eye on the family page to see if any closer relatives sign up. Overall, I’d recommend 23andme if you’re interested in health or ancestry – just be prepared to be underwhelmed if you’re a bit average like me.